Valentine's Day! Well I made this with my friend for her family's annual Valentine's Day Dinner. It is a red velvet cake with whipped cream. There is a sculpted Cupid with his famous bow and arrow (sculpted my me). Then we have a flower bouquet consisting of roses and lilies (made by my friend). Then it has a sprinkle border! 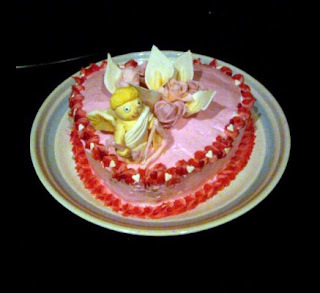 I know that the Cupid and bouquet are kind of squished together. The cake was yummy!